Congratulations to everyone at Hemphill Brothers Coach Company on winning Coach Company of the Year at the Parnelli Awards over the weekend in Anaheim, CA. Way to go team Hemphill! Congratulations to John Stalder on winning Coach/Truck Driver of the Year last night during the 2018 Annual CMA Touring Awards ceremony held at Marathon Music Works in Nashville, TN. Congratulations to Hemphill Brother’s driver Dwayne Harper on being awarded Coach Driver of the Year at the 2016 Top Dog Awards in Palm Springs, CA last Saturday night. The Top Dog Awards are bestowed upon the very best of the best in the touring community as voted on by their peers. The Top Dog Awards Show is the most anticipated evening of the Tour Link Conference. Way to go Dwayne! We are honored and proud you drive for Hemphill Brothers! 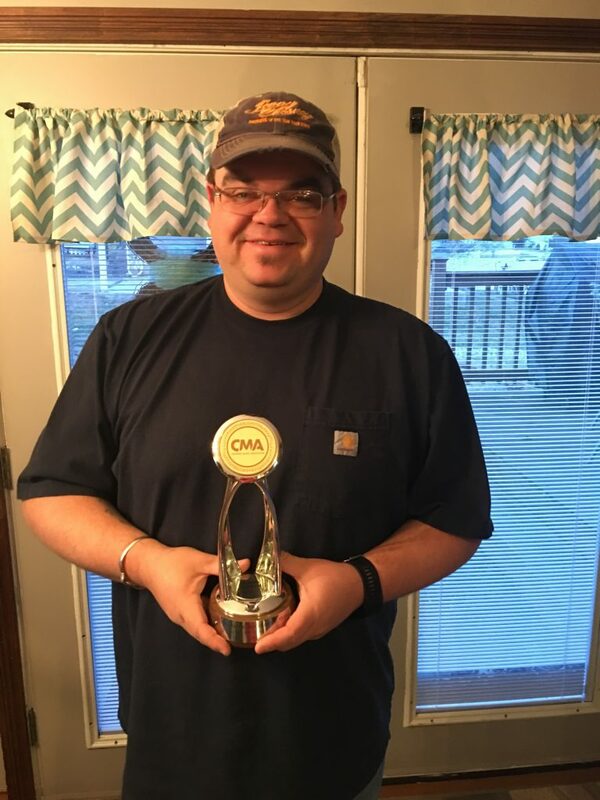 Last week, Hemphill Brother’s driver, Josh Easter was awarded Coach/Truck Driver of the Year at the 2016 CMA Touring Awards in Nashville, TN. The CMA Board of Directors created these awards to honor outstanding professional achievement within the touring industry. Congratulations Josh! We are proud of you and blessed to have you on our team! You represent us well. Congratulations to the award winners listed below. These awards were passed out by Joey, Trent, Mark, Danny/Bruce and Stacie. The “Ron Bear Jones” Driver of the Year award went to Josh Easter, (Runner up Terry Ford) Driver Voted. The “Excellence in Coach Maintenance” Award went to Kevin Robbins (Runner up Kevin Premer) as presented by Danny Settle and Bruce Doughty. The ”Leadership Award” went to Josh Easter, as presented by Joey Hemphill and Trent Hemphill. The “Dwayne Harper” Award of Excellence (Log Book Award) went to Andrew Morton, as presented by Stacie Allen and Most Improved went to Josh Ulbrich. The “Helping Hand” Award went to Danny Fetty, (Runner up, Jared Petit) Driver Voted. The “Rookie of the Year” went to William “Chip” Howland, (20 year Driver, but new to Hemphill) Driver Voted. Kevin Premer was also honored for his 20 years of service, while Bill Compton and Paul Hortop were honored for 25 years of service. Hemphill Brothers Coach Company was honored to be featured in the March 2016 issue of Vi Menn Magazine in Norway. Take a look inside country music singer Barbara Mandrell’s custom RV. Hemphill Brothers created this bus more than 20 years ago and it’s still rolling strong. Click Here to Watch Now as Trent Hemphill takes you on a tour through one of country music’s most recognizable tour busses. Keep your eyes open on those highways and you may spot the Silver Eagle Bus yourself someday. Big Thanks to Travel Channel and Extreme RVs for the chance to showcase our work. Hemphill Brothers held its’ annual company Christmas party on Friday, December 11, 2015 at the historic Fontanel Mansion in Nashville, TN. Fontanel is a 27,000 square foot log home formerly owned by country Music Hall of Fame member and Hemphill client, Barbara Mandrell. Scotty McCreery was on hand to perform many of his numerous hits and several Christmas classics for Hemphill employees, their families and drivers. Hemphill Brothers Coach Company was featured during the Knoxville news last night. Take a look. Hemphill Brothers Coach Company was featured in the Nashville Scene this week. Congratulations Ty Saunders On Being Named Driver Of The Year At The 2014 Top Dog Awards! Congratulations Ty Saunders – Named Driver of the Year at the 2014 Top Dog Awards! Hemphill Brothers took home Coach Company of the Year at the 2014 Parnelli Awards for a sixth time last weekend in Las Vegas. Extreme RVs featuring Hemphill Brothers is scheduled to premiere this coming Sunday, October 5th on the Travel Channel. Travel Channel is planning to premiere two episodes back to back between 9 PM and 11 PM EST. Two brothers can count politicians, actors, and some of the biggest names in music as their clients. JUNE 29, 2014 Trent and Joey Hemphill know a thing or two about busses. Growing up as part of a gospel group, they travelled millions of miles on their family bus. It happened to be the perfect training ground for launching a luxury coach company when they left their careers in music behind. These pioneers in the entertainment industry are committed to exceeding expectations on ever tour. The result has been a client list that’s a who’s who of musicians, actors and politicians. Legendary singer, songwriter and longtime Hemphill Brothers client, Amy Grant made a special appearance at the 2013 annual company Christmas party. Amy and her band performed a combination of her chart topping favorites and Christmas classics for Hemphill employees, their families and drivers. The Christmas standard “Tennessee Christmas,” Christmas favorite “Breath of Heaven” and Amy’s #1 song “Baby, Baby” were all a part of the ten song set. Riverwood Mansion in Nashville, TN was host to the event, while 8 Lavender Lane catered the evening buffet. Special choir music was provided by Kairos. Hemphill Brothers Takes Home “Coach Company of the Year” for a Fifth Time at the 2013 Parnelli Awards in Las Vegas. Pick up the latest copy of People Country & go on the road with The Band Perry in their home away from home! April 24, 2013 – Ernst & Young LLP today announced the finalists for the Ernst & Young Entrepreneur Of The Year 2013 Award in the Southeast, which includes Alabama, Georgia, North Carolina, South Carolina and Tennessee. The prestigious award program recognizes entrepreneurs who demonstrate excellence and extraordinary success in such areas as innovation, financial performance and personal commitment to their businesses and communities. These business leaders were selected by a panel of independent judges from a pool of 90 nominations. The 90 Southeast applicants employ more than 42,000 people in the workforce, and report more than $8.5 billion in annual sales. Notably, Southeast finalists represent 79 percent of the employee total and 82 percent of the revenues reported. Award recipients will be announced at a gala on June 6 at the InterContinental Buckhead Hotel in Atlanta. Regional award winners go on to compete at the national level. Award winners in several national categories, as well as the National Ernst & Young Entrepreneur Of The Year Overall Award winner, will be announced at the annual awards gala in Palm Springs, California, on November 16, 2013. The awards are the culminating event of the Ernst & Young Strategic Growth Forum®, the nation’s most prestigious gathering of high-growth, market-leading companies. In the Southeast, regional sponsors include King & Spalding LLP, Merrill Datasite, PNC and Vaco. Also in 2012, Dwayne Harper celebrated 20 years with Hemphill Brothers Coach Company and was honored by the company. Hemphill Brothers Coaches to be featured on “Extreme RV’s” premiere block on Travel Channel! Fall brings a new season for our favorite TV shows and once again Hemphill Brothers Coaches is proud to be included in “Extreme RV’s” premiere block on Sunday, November 11th starting at 9:00PM ET/PT on Travel Channel! Tune in on November 11th and check it out. In the first all-new episode (airing at 9:00 p.m. ET/PT), the Hemphill Brothers, who have been building custom coaches for decades, are creating a one-of-a-kind mobile mansion for country sensation The Band Perry – complete with a rolling mobile studio! Trent and Joey Hemphill had the pleasure of appearing on the cover of the August 16-22 issue of American Profile Magazine (www.americanprofile.com). With a circulation of over 20 million they received tons of positive feedback. Most notably to Trent and Joey was an additional font page article in their home town newspaper, The Bastrop Daily Enterprise (www.bastropenterprise.com) ! Check out both sites for the full stories. This Friday may be the first time in his extensive career that Ronnie Dunn has ever been featured alongside hip-hop Producer Timbaland and X Factor and Idol creator Simon Cowell, but on this week’s airing of HGTV’s Celebrity Motor Homes, Dunn takes fans behind the curtain to see his home on wheels—his tour bus! Tune in to HGTV this Friday, June 8 / 9 p.m. ET. Hemphill Brothers Coach Company was thrilled to join forces with ShowHope to make their dreams of a double decker bus thrift store become a reality. A bus was shipped from England in early 2012 and converted to a rolling store where college kids could donate clothing, shop and give donations for orphan care. The Red Bus Project is currently traveling to universities across the southeast this Spring with hopes of additional stops in the Fall. For more information, pictures and video clips, log onto www.redbusproject.org. Each January Hemphill Brothers Coach Company brings together all of their drivers for the annual Driver’s Meeting. In 2012, the drivers gathered for a morning of updates, new rules and regulations and celebration of the past year’s accomplishments, including awards of excellence. Below is a list of the awards given and this year’s recipients. Also during the meeting, Kurt Fetty celebrated 20 years with Hemphill Brother’s Coach Company, while Jim “Casper” Dezwarte celebrated 25 years and Ron “Bear” Jones celebrated 30 years. From that day forward, the Driver of the Year was named the Ron “Bear” Jones Driver of the Year Award in honor of his 30 years of service. The 31st Annual Hemphill Brother’s Christmas Party was held in December for employees and their families at Gaylord in Nashville, TN. Everyone enjoyed a sit down dinner and giveaways throughout the evening. Music was provided by the Silver Strings before and during dinner. Later that night, Russ & Becky Jeffers and the Smokey Mountain Sunshine Band played and sang for everyone in attendance. They performed for many years at Opryland Theme Park until it closed. Trent and Joey Hemphill were presented with checks for their favorite charities from the employees. Trent’s check was for the Bridge Ministry, while Joey’s went to Make A Wish. The night was filled with many memories, family fun and celebration of a wonderful year and season. The Travel Channel is set to re-air the highly acclaimed “Extreme RV’s” block on Sunday, February 19, 2012. Hemphill Brother’s Coach Company will be featured during the 6:00 pm (est) hour and will showcase the making of two brand new buses. The hour-long program highlights the Hemphill Brother’s facility, their shop employees and their unique craftsmanship of their custom coaches. Be sure to tune in! It’s the best of the band buses with Hemphill Brothers, a family’s dream of sprinting in style comes true thanks to CMI, and big things from the Tumbleweed Tiny House Co. TV-PG, CC. Trent and Joey Hemphill were recently interviewed for an article on Hemphill Brothers Coach Company for Country Weekly Magazine. Hemphill Brothers Leasing Co., LLC. has hired Randy Pitman as their Chief Financial Officer. Pitman, a CPA, received his Bachelors of Science degree in Accounting from Tennessee Tech University. Before joining Hemphill Brothers he worked for Comdata Corporation where he served most recently as the Executive Vice President of Finance. Prior to Comdata Pitman was an Audit Senior for Arthur Andersen & Co. in Nashville, TN. In mid-December Hemphill Brothers Coach Company held their annual Employee Christmas Party to bring everyone together for the holiday season. Each year the event gets bigger and bigger as they host 150+ employees and their families. For the past few years this gathering has been held at Gaylord Opryland’s Springhouse Golf Club and this year they welcomed a special performance from a long time client, Dierks Bentley http://dierks.com/. Past performers have included The Silver Cornet Band, Phil Vassar and many of their very talented employees and their children. The Nashville Strings played in the background as all enjoyed a family style dinner with all the trimmings. In between bites everyone checked their raffle tickets that they had been given to see if they were lucky enough to win one of the many door prizes given out during the party. In lieu of gifts for the owners, Trent and Joey Hemphill, the drivers and employees pooled together their money and donated $1,200 to each of Trent and Joey’s favorite charities, The Bridge Ministry (http://www.bridgeministry.org/) in Trent’s name and The Make-A-Wish Foundation of Middle TN (http://www.midtnwishes.org/) in Joey’s name. As things winded down the evening ended with everyone singing along to Silent Night. Here are a few PHOTOS from this wonderful event. Each January Hemphill Brothers Coach Company brings together all of their drivers to go over the past years accomplishments and to hand out awards. This year we also awarded Paul Hortop with a Rolex watch for 20 years of excellent service to our clients…keep on rolling Paul! CLICK HERE for a list of the awards given each year and their 2010 recipients. If you tuned your televisions to The Oprah Show on May 5th, 2010 you got some valuable fashion tips. Oprah’s broadcast on that day included a segment called “Make Over My Man” and Hemphill Brothers was able to provide the mobile salon for the unsuspecting gentlemen. Check your local listings for show times and channels. Here is a photo of the Mobile Salon. Hemphill Brothers has been nominated in the category of Coach Company of the Year for the 2009 Parnelli Awards. This year’s ceremony will be held November 20, 2009 in Orlando, FL. They hope to follow up their 2006 win by bringing home the top prize. Check out www.parnelliawards.com to see how you can cast your vote for Hemphill Brothers Coach Company. Thank you for all your support! And the winner is…HEMPHILL BROTHERS COACH COMPANY! Each January Hemphill Brothers Coach Company brings together all of their drivers to go over the past year’s accomplishments and to hand out awards. This year was another great year for our drivers with 97% clear MVR’s. We also logged 5,890,000 miles and this year Terry Ford celebrated his 20th year of driving for Hemphill Brothers. Way to go drivers! See Below for a list of the awards given each year and their 2010 recipients. For showing that even though they have only been with Hemphill Brothers for a relatively short time, they have what it takes to someday be a driver of the year. Hemphill Brothers was honored to have one of their long time clients, Diamond Rio, perform at their 29th Annual Employee Christmas Party. They played many of their hits and some Christmas classics. The employees and their families were welcomed into the Gaylord Springs Golf Club by the string quartet Silver Strings. All enjoyed a lovely buffet style dinner and the night included wonderful gifts and prizes.